Nowadays, when a baby is born and the proud parents want to share their joy with relatives who live far away, they send them pictures via email, or upload them on facebook, or even chat via Skype. Technology has given us endless possibilities to keep in touch with our loved ones who live in a different city or country. But things were very different in the nineteenth century. If a relative lived far away from home, they would receive a letter with the news of the happy event and, if the family was well-off, maybe even a small miniature. But years might have passed before a father or brother, for instance, had the chance to meet their new born child and sibling. This was the case with Napoleon and his favourite sister Pauline. In 1779, when he was about 10 years old, Napoleon had left his family and his native Corsica to go to school in mainland France and, once finished his studies, he joined the army. Because of this, he didn’t return home until 1786 and by then, the family had grown. 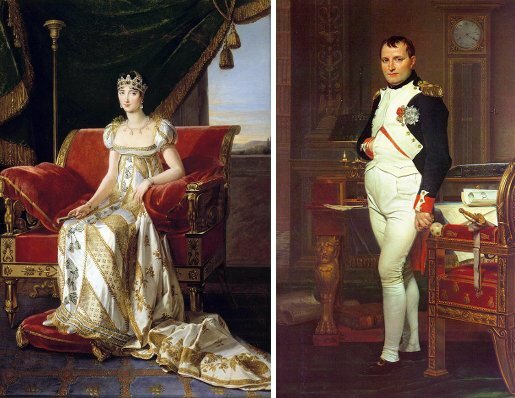 Napoleon had three new siblings: Paulette, Gerolamo and Caroline. But it was six years old Paulette who captured his heart. And she wasn’t even at home to greet him when he arrived! She had actually gone to run and play in the fields. Finally, Paulette returned home to meet her seventeenth year old brother. Napoleon was wearing his uniform of Second Lieutenant of Louis XVI’s army and seemed to be very proud of it. His family seemed happy to finally see him again but were also in awe of him. Not Paulette. She was barefoot, her skin was tanned, her dress worn out but her big blue eyes were very sweet. Although a little girl, she already had a somewhat feminine air. Napoleon was smitten. She was the one who would make him laugh and smile. The two siblings become really close from the start and Napoleon realised that the little girl had a disinterested love for him. And she would show that in the years to come. When Napoleon’s star started to fade, it was Pauline who did all she could to help him. But that’s a topic for another post.